NEW PORT RICHEY, FL, October 12, 2017 (Newswire.com) – Spectators filled the grandstands at Madera Speedway on Saturday, October 7, 2017 to watch the conclusion of the eight races, 51Fifty Junior Late Model series in Madera, CA. They came to see what you can’t see anywhere else in the country — the best 10 to 16-year old racers in the country compete in late model stock cars in a nationally televised series seen on MavTV. Needless to say, they were not disappointed. The series had been dominated up to the final race by 12-year old racing prodigy, Jesse Love, from Menlo Park, CA. Love drives for Naake-Klauer Toyota and his primary sponsor is 51Fifty Energy Drinks. Love came into the final race with a commanding point lead and four wins under his belt. Some of the best young drivers in the country were determined to take the checkers for the final race. The field consisted of big names in the driver development arena, including but not limited to the Naake-Klauer Toyota Racing teammates Jesse Love and Hailey Deegan, Eric Nascimento of Nascimento Motorsports, and Adam Lemke, a Race Face Brand Development driver. There was a common goal among the drivers that night…. take down the final win of the season and beat the formidable Jesse Love. Love drew a P6 for the after qualifying invert allowing the remainder of the field to draw a breath of relief before the race. At the 50-lap midway break, Love had worked up to fourth in a race that had been dominated by Eric Nascimento. Once the green flag flew for the second and final stage of the race, it was, simply put, the Jesse Love Show. Love, who had apparently been saving his tires and equipment for a second-stage run, passed teammate Hailey Deegan on the outside followed by an immediate outside pass of Berry to put him in second position. He then set his sights on Nascimento, running him down in short order. Nascimento went to defend the highline when Love dove to the inside, overtaking Nascimento for the lead. Love is the youngest Champion to date for the series, but this is nothing new for Love. He started his racing career at 5 years old with Quarter Midgets of America and by 8 he was a QMA National Champion with 9 California Championships. He received a “double year” waiver from the United States Auto Club (“USAC”) to start running USAC Midgets at 10, instead of having to wait until he was 12. He won the USAC Restricted Championship that year. In 2016, he went on to become the youngest USAC Focus Champion in history winning both the USAC Focus Overall Championship and the USAC Focus Dirt Championship for the West Coast. Love has already been crowned the 2017 USAC Focus Dirt Champion and leads the points for both the Pavement and Overall Series on the West Coast. Love heads off to Las Vegas Motor Speedway (“LVMS”) where he will run double duty in his Naake-Klauer Toyota late model and USAC Midget for the Fall Senator’s Cup Classic on October 20, 2017. 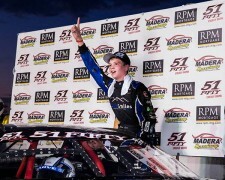 Love is the track record holder in the junior late model class at LVMS. He also won the 2016 Fall Senator’s Cup Classic in the USAC Midget division. Love will look to conquer all again October 20, 2017 as he defends his track record and 2016 Senator’s Cup win. ~ Article written by Rod Wortham, Founder/CEO Race Face Brand Development.